A poll showing that former Bogota Mayor Enrique Penalosa could defeat President Juan Manuel Santos in Colombia's coming presidential election has shaken that country, and - although Santos remains the front-runner in other polls - says a lot about Colombia's fatigue with its traditional political class. Granted, the Datexco poll published Monday by the daily newspaper El Tiempo, which showed that Penalosa, the Green Party candidate, was likely to win a second round vote by 40.4 percent of the vote to Santos' 37.1 percent, was a telephone poll with a 3.1 percent margin of error. Telephone surveys often overrepresent higher-income households, and are usually less accurate than in-person polls. And, to be sure, Penalosa could face the same fate as his predecessor. Former Green Party candidate Antanas Mockus, also a former Bogota mayor, generated a lot of excitement as a presidential candidate in 2010, but Santos beat him by a 2-to-1 margin in the second-round vote. Penalosa, however, has several things in his favor. He won the March 9 Green Party primary by many more votes than Mockus got in the 2010 general election. A Duke University graduate in economics, with a doctorate in public administration from the University of Paris, Penalosa is one of Latin America's most innovative urban planners, and has earned a reputation as a problem-solver. As mayor of Bogota from 1998 to 2001, Penalosa set in motion the Transmilenio mass transit system, and popularized bicycle-riding by creating 190 miles of biking paths throughout the city. He often says that "an advanced city is not one where even the poor use cars, but rather one where even the rich use public transport." He moves within Bogota - and campaigns - riding his bike, and prides himself of not walking around with bodyguards. When I interviewed Penalosa on Wednesday, he told me that Santos is a "relatively vulnerable candidate." "There are some people who don't connect much with citizens, but are elected because they are backed by others who do connect very well," Penalosa said. "Santos was elected thanks to (former President Alvaro) Uribe's support." Asked how he could win without Santos' political machine, Penalosa responded that political machines are not as crucial in general elections as in local elections because the national media give free coverage to all major candidates. On foreign policy issues, Penalosa told me that Santos has been "too conciliatory with Venezuela." He added, "Without Colombia meddling in any way in Venezuela's internal affairs, I think that Colombia should express more clearly its disagreement over the restrictions to democracy that are being progressively implanted in Venezuela." Colombian political watchers tell me that Penalosa is benefiting from several factors. First, voters are tired of the ongoing fight between Santos and Uribe, the charismatic former president who picked Santos - his former defense minister - as his political heir, and then turned into his biggest enemy. Second, Uribe, who was elected senator in the March 9 legislative elections, has been crisscrossing the country attacking Santos for his peace negotiations with the FARC guerrillas, his alleged failure to stop rising crime rates, and his friendlier ties with neighboring Venezuela. Uribe's relentless anti-Santos campaign is indirectly benefiting Penalosa. Third, Penalosa's campaign sounds fresh, and aimed at solving people's most immediate problems. "We're seeing a major loss of credibility of Colombia's political class," says well-known Colombian political analyst Pedro Medellin. "There's no question that Penalosa is benefiting from this." Javier Restrepo, a pollster with the Ipsos polling firm in Bogota, cautions that Penalosa has image problems, too. He sometimes comes across as too brainy and condescending toward those without his academic credentials, which could hurt him in the campaign, Restrepo said. "Clearly, public opinion is telling us that we want somebody else in the race, and Penalosa has so far represented that 'somebody else,' " Restrepo told me. "The big question is whether he will be able to keep up with the people's expectations during the upcoming campaign." My opinion: I still think that Santos is likely to be re-elected, because he will have a much more powerful political machine than any of his rivals. But -- considering that Santos' poll numbers for the May 25 first-round vote remain stuck at only 27 percent, and that this time he doesn't have a powerful figure like Uribe behind him - this could end up in an "everybody-against-Santos" second-round election. In that scenario, Santos will face a much tighter race than in 2010, one in which his victory won't be easy. 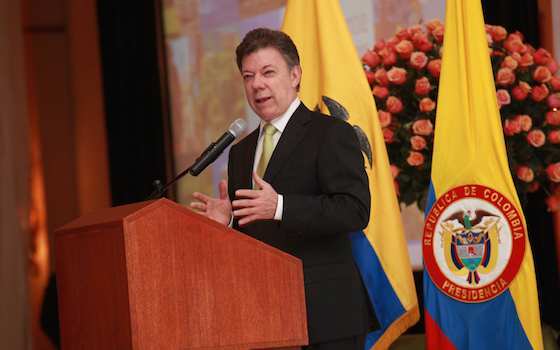 "Colombia's Santos Re-election Won't Be Easy"